Yeşim has been the owner of a pharmacy in Ankara since 2009. She is the mother of two children, whom she takes care of in balance with a busy and satisfying working life. After completing a BA in pharmacy she decided to open up her own business because she felt the need to be autonomous in the daily exercise of her job. “I always wanted to be independent. This is why I worked hard to open up my own pharmacy in Ankara. 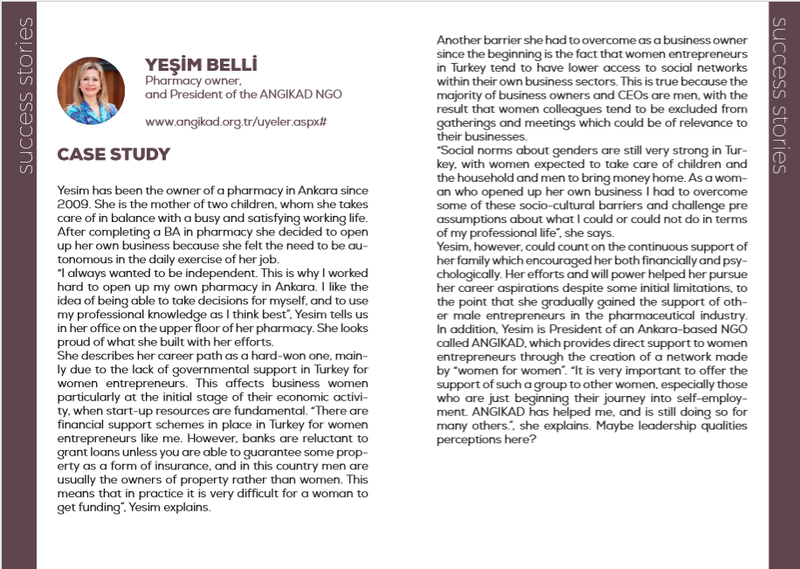 I like the idea of being able to take decisions for myself, and to use my professional knowledge as I think best”, Yeşim tells us in her office on the upper floor of her pharmacy. She looks proud of what she built with her efforts. She describes her career path as a hard-won one, mainly due to the lack of governmental support in Turkey for women entrepreneurs. This affects business women particularly at the initial stage of their economic activity, when start-up resources are fundamental. “There are financial support schemes in place in Turkey for women entrepreneurs like me. However, banks are reluctant to grant loans unless you are able to guarantee some property as a form of insurance, and in this country men are usually the owners of property rather than women. This means that in practice it is very difficult for a woman to get funding”, Yeşim explains. Another barrier she had to overcome as a business owner since the beginning is the fact that women entrepreneurs in Turkey tend to have lower access to social networks within their own business sectors. This is true because the majority of business owners and CEOs are men, with the result that women colleagues tend to be excluded from gatherings and meetings which could be of relevance to their businesses. “Social norms about genders are still very strong in Turkey, with women expected to take care of children and the household and men to bring money home. As a woman who opened up her own business I had to overcome some of these socio-cultural barriers and challenge pre assumptions about what I could or could not do in terms of my professional life”, she says. Yeşim, however, could count on the continuous support of her family which encouraged her both financially and psychologically. Her efforts and will power helped her pursue her career aspirations despite some initial limitations, to the point that she gradually gained the support of other male entrepreneurs in the pharmaceutical industry. In addition, Yeşim is President of an Ankara-based NGO called ANGIKAD, which provides direct support to women entrepreneurs through the creation of a network made by “women for women”. “It is very important to offer the support of such a group to other women, especially those who are just beginning their journey into self-employment. ANGIKAD has helped me, and is still doing so for many others.”, she explains. Maybe leadership qualities perceptions here?